Providing the best ferret food to your favorite pet is a significant contribution to its health and well-being. While most of us are familiar with different kinds of cat and dog food, ferret diet still remains unclear, even for some owners of these curious little animals. So let’s pin down what ferrets should and should not eat in order to stay strong, healthy and happy. 1. Wysong Ferret Archetype – Raw Freeze-Dried Ferret Diet. 2. Wysong Ferret Epigen 90 Digestive Support – Dry Ferret Food with Prebiotics and Enzymes. 3. 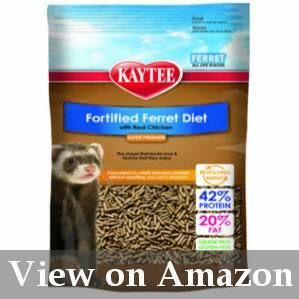 Kaytee Premium Ferret Nutrition Diet Pet Food – Poultry-Based Ferret Food for Revolving Diet. 4. Marshall Pet Products Select Chicken Formula Premium Ferret Diet – Select Chicken-Based Ferret Kibble. 5. Marshall Bandits Premium Ferret Treats Variety Pack – Multi-flavored Chicken-Based Ferret Treats. Study the ingredients very carefully. Freshness and food processing technology. Can Ferrets Eat Fruits and Vegetables? What Human Food Can Ferrets Eat? What Can I Feed My Ferret Other Than Ferret Food? What Do Ferrets Like To Eat? Ferret diet in the wild consists mostly of whole prey and sometimes eggs. These animals are strict carnivores, they don’t eat plants. Fibers, grains and carbohydrates constitute a minuscule share of their ration. Naturally, your pet ferrets should eat the same diet. Animal proteins should satisfy at least 30 – 40% of their daily nutrition requirements. So feeding your ferret with raw meat or specialized ferret food would be the right decision to make. In their natural habitat ferrets eat almost anything they can catch – from mice to small birds and sometimes eggs. Their daily ration almost 100% consists of animal food. Now, as we have straightened out the basic facts about ferret diet, we can move on to reviewing the top-five ferret foods available on the market. And also get answers to the most burning questions that relate to the happiness of your beloved pet. Wysong Archetype is a freeze-dried meat-based ferret food. Its main ingredient is chicken (including bones and organs). The food also contains plant nutrients, including fruits, berries, vegetables and seeds. However, the amount of plant-based components is very insignificant, so the product is considered rather healthy for ferrets. Wysong ferret food processing technology is different from those used by other manufacturers. They use only raw ingredients and freeze-dry them to obtain a product that can be stored at room temperature, while preserving all the nutrients. Besides that, Wysong Ferret Archetype is supplemented by an array of vitamins, probiotics, minerals, and micronutrients that contribute to a wholesome ferret diet. Wysong Ferret Archetype is suitable only for adult ferrets. The manufacturer offers several ways this product can be consumed. You may give it to your ferret in chunks as a treat or reward. Alternatively, you can rehydrate it by soaking it in warm water for 10 – 15 minutes. Shreds and powder can be mixed in with water to form a gravy-like substance to be served on top of main meals. Contains 44% protein and 36% fat, which is above the average ferret diet recommendations. Processed under low temperatures to keep all the natural nutrient elements intact. Enriched with vitamins, micro and macronutrients, probiotics, and nutraceuticals. Very low in fiber (only 0.5%) and plant-based components. Comes in rather small bags (7.5 ounces). There is no economy pack. Not suitable for young ferrets. Wysong Ferret Archetype is a raw chicken-based ferret food, claimed to provide a healthy and balanced ferret diet. It is very low in carbs and fiber, while its protein and fat content exceeds the general recommendations on ferret nutrition. It comes in chunks that a ferret can eat in a number of ways. Wysong Archetype ferret food might become an effective part of a balanced ferret diet. Wysong Digestive Support is a special ferret food formula, designed to improve digestive health in ferrets. It is enriched with prebiotics, probiotics, and enzymes that ensure proper functioning of a digestive tract. This product is also very rich in protein – not less than 60%, while fat is only 16%, which is slightly lower than recommended. Crude fiber content reaches 5%. Like most of the bagged ferret foods, Wysong Ferret Epigen 90 Digestive Support comes in form of dry kiddles. You can moisturize it if you wish to provide a softer meal to your ferret. The main ingredient in this food is chicken and its by-products, bones, and chicken meal. This product has a rather rich formula, which might cause digestive upset in ferrets if consumed in very large quantities. So it is better to mix it with some other food (preferably the one that is higher-fat) to form a truly wholesome diet. Wysong Digestive Support is supplied in a large 5-pound bag, which is supposed to last around 12 weeks for one ferret. It might last even longer if you combine it with other types of ferret food. Supplemented with prebiotics, probiotics and enzymes that improve digestion. Has a full range of essential vitamins, micro- and macronutrients and minerals, including Omega-3 and Omega-6 fatty acids. Fat content is not sufficient (16% as opposed to 20% recommended by ferret diet specialists). Fiber content is higher than in most other premium ferret foods. Wysong Ferret Epigen 90 Digestive Support is a balanced ferret diet that is designed to support the animal’s digestive health. On one hand, its protein content is very close to the ferret natural diet. On the other hand, it has only moderate amount of fat and slightly excessive amount of fiber. In general, this product is rather high-quality and can be successfully used alongside with other kinds of ferret foods to even out the disproportion in its macronutrient ratio. Kaytee Premium ferret food is a chicken or turkey-based blend formulated to practice a revolving diet. The key principle of a revolving diet is to provide your pet with different types of protein interchangeably at regular intervals. In such a way a ferret won’t get used to eating only one type of meal and will be able to easily switch from one food to another without having the upset stomach. Kaytee Premium is guaranteed to contain 42% protein and 20% fat and 3% fiber at most. These ratios meet the regulatory standards on a ferret diet. This product comes in two versions – with chicken meat and with turkey meat. It does not contain any grains or grain protein (gluten). However, it contains some amount of pea meal, which is not exactly a healthy ingredient in a ferret diet. This ferret food is suitable for animals of all ages. If you soften crunchy pallets with some warm water, then even young kits will be able to eat it. Kaytee Premium is recommended for ferrets from 6 weeks and older. Comes in two versions with different proteins to make up a balanced revolving diet. Sufficient fat and protein content. Kibbles break easily, so some of the bag contents might arrive in crumbs and even powder, which your ferret will hardly enjoy eating. Kaytee Premium is a decent medium-market ferret food. Its protein, fat and fiber content is optimal for a mass-production kibble ferret food. The main distinctive feature of this product is the idea of a revolving diet behind it. However, presence of pea flour is a significant drawback that does not allow us to recommend this food as a primary component of a ferret diet. 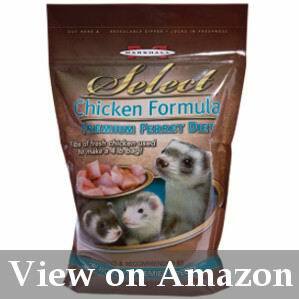 Marshal Select is dry processed ferret food made primarily of chicken and chicken by-products. It contains no less than 36% of protein, which is within the recommended range. Fat content is not less that 18%, which is quite close to the optimal 20% recommended by ferret diet specialists. The amount of fiber in Marshall Select is less than 4%. Marshall Select ferret food is also rich in micronutrients. It contains taurine (an acid that is vital for ferrets), vitamins A, D3, E, B6, B12 and others. Judging by the macro and micronutrient contents, this product has a potential to provide a well-balanced ferret diet. This ferret food comes in dry, hard pellets. It is good for grown-up ferrets, since eating hard food helps them exercise their jaws. Young animals (under 11 weeks old) should eat these pellets in the moisturized state. All the feeding recommendations are given on the back of the package, so you won’t have to do any additional research. Marshall is a reputable pet food manufacturer. They use a special food processing technique that allows them to retain all the nutrients in their integral state. Optimal protein and fat content. Corn meal is among the top-6 ingredients of this product, meaning its content is rather significant. Corn is among the products that ferrets should not eat. Although there is no information on how much corn exactly each serving of this food has, this is still a rather significant drawback of Marshall ferret diet. Marshal Select Chicken Formula Ferret Diet is protein and fat balanced food, enriched with vitamins and micronutrients. It comes in dry pellet-like form and is suitable for animals of all ages. However, due to presence of corn meal among the ingredients, ferrets should eat it in moderate amounts and in combination with other high-protein foods. Marshal Bandits is a meat-based ferret treat. It is available in five flavors (bacon, banana, chicken, peanut butter, and raisin) and comes in a pack of five 3-ounce bags. It is very convenient if your ferret is not a particularly picky eater or if you buy it for the first time tentatively. If your ferret prefers treats with a particular flavor you might want to look for this product in retail stores, where each kind is sold separately. Ferrets are known to have a sweet tooth, but they should not eat sugar in any forms. Although banana and raisin-flavored Marshall treats are expected to be sweet, they do not contain sugar, only artificial flavoring. This might not sound like a healthy component of a pet food, but considering you give the treat to your ferrets only occasionally, it’s unlikely to cause harm. All five kinds of Marshal Bandits treats have the same list of ingredients (the only difference is in the type of flavoring used). They are chicken-based and contain 25% protein, 9% fat and 2% fibers. Evidently, a healthy ferret diet should not depend on treats, since this type of food cannot provide sufficient nutrition value. Comes in different flavors, so that a ferret has a choice and enjoys the variety. The product is chicken-based and sugar-free. A zip-lock bag closes tightly and keeps the treats fresh. The treats are soft and perfect for chewing. You have to purchase the whole pack of flavors even if your ferret dislikes some of them. 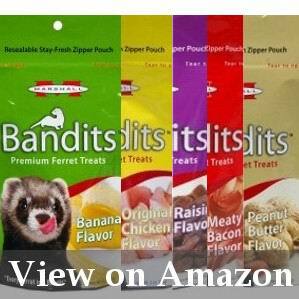 Marshal Bandit Premium Ferret Treats is a multi-flavored variety pack of soft, chicken-based morsels. They are sugar-free and contain only 2% fibers. The protein content is not particularly high (only 25%), but as for a treat which is not supposed to be eaten very often, that is quite acceptable. Some ferrets are picky eaters, while other would eat almost anything that comes in their sight. In both cases securing a proper diet for your ferret is a key to its happy, healthy and long life. Raw meat and frankenprey diet are preferable, but you can diversify it with high-quality dry ferret food. We suggest you some tips on how to choose the best ferret food. Pay attention to the nutrition facts (or Guaranteed Analysis, as usually labeled on pet food packages). Ferrets are strict carnivores, meaning they should eat mostly meat and animal-based food. So you should stick to high-protein and grain-free ferret food. The minimal amount of protein that is acceptable in food that ferrets eat on a regular basis is 36%. Fat is also important. The American Ferret Association recommends that ferrets get around 20% of their daily calories from fat. Foods that contain less fat or protein should be avoided or at least complemented by more wholesome dietary components. In the wildlife it’s impossible to completely avoid vegetative food, so small amounts of vegetables, grains and fiber are present in a natural ferret diet. Therefore, it is acceptable for commercial ferret food to contain minimal amounts of fiber (usually no more than 5%, but the less the better). Ferrets are intolerant to gluten, sugar and starch (that means they cannot eat them in any quantities). So you should read the list of ingredients every time you buy a pack of food to make sure the unwanted components are not included. It is also important to know that usually the top six ingredients on the list are those that are present in the most significant quantities. Ideally, all of them should be either meat, meat by-products, bones or other animal components. You should also look for things that can be beneficial to your ferrets. Most of the ferret diets are enriched with vitamins, minerals, micro- and macronutrients. Some manufacturers go even further and include probiotics, enzymes and ferments to support proper digestion in ferrets. Consider age recommendations. Some ferret foods are suitable for animals of all ages, while others are formulated only for adults. So you if you have a young pet (under 11 month old), you should pay extra attention to such recommendations. The raw diet is beneficial to ferrets, since it provides all the nutrients in their unchanged state. If you choose to feed your ferret with processed food, you should at least find the kind that is produced with minimal heating. Freeze-dried food is a good choice. It has all the nutrients that are available in raw products, but has a much longer shelf life and can be kept without refrigeration. Chicken is the most popular type of meat in middle-market ferret foods. It is comparatively cheap and high in easily digestible protein. Turkey is also quite common. In fact, ferrets can eat chicken and turkey interchangeably as a part of a revolving diet. Such diversity is usually easy on their stomachs. It’s always wise to buy ferret food from reputable manufacturers, which have high quality standards and are responsible for the quality of their products. Consider the package size. In most cases buying a large pack of kiddles is more economical that several small packs that make up the same amount of food. However, if you are introducing a new type of food to your ferret, it is better to buy a small pack at first. In that case if the pet refuses to eat this particular kind of food, you won’t be left with a large bag of useless kiddle. Let’s consider the most common questions and get answers to them. Although cat food doesn’t have the perfect protein, fat and carbohydrate ratio, it is quite high in proteins. The best high-protein cat food can be included in specialized ferret diet. Kitten food has an even better macronutrient ratio for ferrets. In case ferret food is unavailable, it can be substituted with premium kitten food, but only as a temporary measure. Dog food is not nearly as high in proteins as ferret food. It cannot satisfy the animal’s daily nutritional requirements. Besides, it contains too much carbohydrates, so feeding ferrets with dog food are highly inadvisable. Absolutely no. Ferrets cannot digest fibers, so fruits and vegetables can make them sick. Specialized ferret food already contains a safe amount of fibers (usually no more than 3-4%), so you don’t need to feed your pet with any other fiber-containing ingredients. In its conventional form, none. In no case should ferrets eat leftovers from your table. Although, you can feed a ferret with some raw meat from the piece you would cook for yourself. In addition, you can give your ferret some raw eggs or cooked meat as an occasional treat. Raw meat, animal carcasses, eggs, and specialized dry ferret food is basically all you can feed your pet ferret with. Ferrets should have access to food all day long so that they can eat whenever they want. You should also make sure your pet receives sufficient amount of water throughout a day. Ferrets like everything they can hunt or find in the wild. Eggs are among their special delicacies. Some animals can catch and eat insects or spiders. Many ferret owners discover their pets to be fond of sweets, but giving a ferret anything sweet (especially chocolate) is strictly prohibited by pet food specialists. Health and wellbeing of your ferret largely depend on its diet. Therefore, you have to be scrupulous about what your ferret eats on a daily basis. Dry kiddle food is only one option you have among the few. Alternatively, you can buy high quality cat/kitten food, provide your pet ferret with whole prey diet or combine different types of food. The list of processed ferret foods suggested in this article is far from comprehensive. There are many more products on the market. For instance, you can try Natural Gold ferret food or Sheppard and Greene ferret food. If you follow our general recommendations, you will surely find the best food for your little fuzzy friend. Please note, that all the information provided here has been taken from open sources on the Internet. We do not claim to be ferret diet experts. Please, consult with your veterinarian before giving any new food to your ferret.